Bathroom paints are certainly in the blues - but also the neutrals and the golden yellows! But a cool blue is a hot color choice for bathrooms. Yet many still get the "blues" over paint colors for their bath. No need to be blue! The popular blue hues really can work well for you in your bathroom. They can give a spa-like feeling to your room. 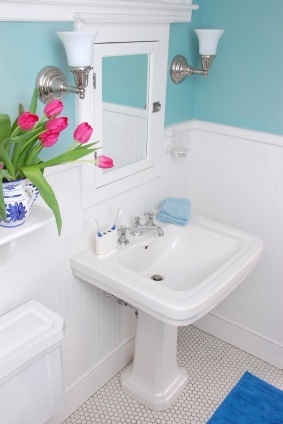 "This classic bathroom design shines with a clean, crisp look using blue walls and white wainscoting." And even a white paint with a tint of blue will add a similar ambiance. The white base adds a fresh clean look to your decor. Farrow & Ball's Pavilion Blue is a pale shade with just a hint of blue. Blue and white is one of the most crisp interior color combinations. You can use these fresh colors to paint a child's bathroom window. Create a frosty effect with blue and white ocean waves. Blue is considered a "safe" color. It reflects so well on the skin, you almost can't go wrong. Sherwin Williams Paint has two aqua blue shades. They offer "Retiring Blue" and "Timid Blue." And to keep things on the edge, why not try a turquoise shade - reminiscent of the 1950's. Benjamin Moore's Bahaman Sea Blue is a brilliant turquoise. 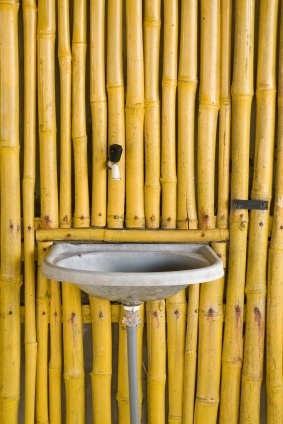 "This rustic sink with the yellow bamboo walls was purely an inspiration from Brasil!" When using turquoise, just a splash of the shade should do the trick. This bathroom paint will stir up visions of a tropical paradise. And you can continue the tropical theme by having a bamboo wall. Bamboo walls or flooring are eco-friendly choices. Bamboo baskets provide a smart storage solution for a kid's bathroom. 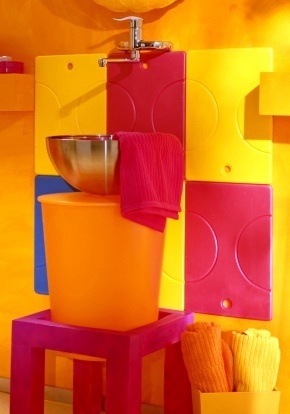 And bold and bright colors are a smart choice to use around young children. "This colorful bathroom could be great fun for a pool house!" Why not create a beach ball theme with a multi-colored look? 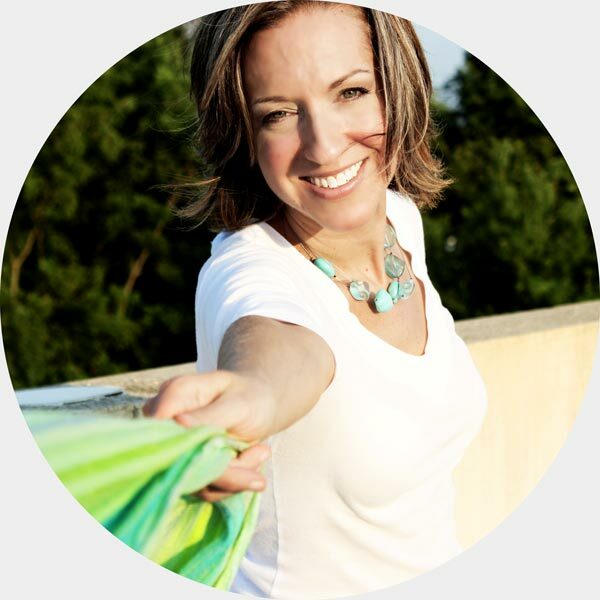 These colors will create energy and a fun look! Frankly my inner child is loving this theme! Or have some fun and make it your guest bathroom! But maybe you prefer a more sophisticated look. If you like the traditional style, you can use a golden yellow shade with a dreamy white trim. 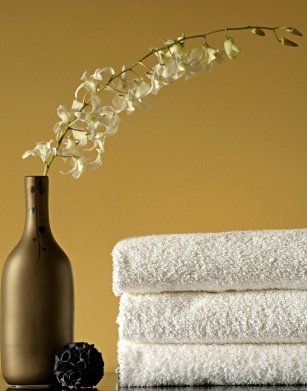 If you want a bold statement in your bathroom you can choose Sherwin Williams "Glitzy Gold." If you prefer a light yellow tone then try their "Lantern Light." "Lantern Light" is a perfect choice for a powder room. The color is so light and airy! It can work wonders in a small bathroom. So, bathroom paints don't have to be "blues." Shades of blue can create a serene bathroom. But don't be afraid to explore the universe of color - beyond the blues!